Brainchild Pictures strives to create educational content that relates to our Asian roots, and yet transcends cultural boundaries to reach out to audiences around the world. Their maiden project Wa Is For Wayang was a short film about an Indian boy on a quest to learn Chinese opera and ran for more than 2 years at a commercial theatre. In October 2014, Brainchild Pictures also launched a bilingual picture book Little Wayang Kid, adapted from the short film Wa Is For Wayang. With the support of IMDA, a full feature-length movie Wayang Boy, which is an extended cinematic version of the original characters from Wa Is For Wayang, was released in Singapore, Malaysia and Brunei. The movie chronicles a boy from India as he settles into his new home in Singapore and tumbles upon an art form alien to him, traditional Chinese Opera. The movie won Best Foreign Comedy Feature in 2015 International Family Film Festival in USA. 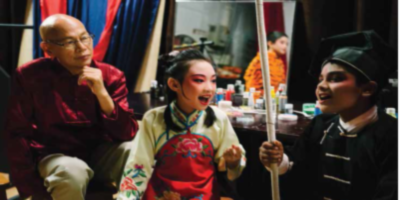 In 2017, Brainchild Pictures produced The Wayang Kids, which continues to spotlight the traditional Chinese art form of Beijing opera with actors from diverse cultural backgrounds, while focusing on the universal themes of family and friendship. Brainchild Pictures aims to blend the rich and colourful Asian cultures into artistic projects that cater not only to audiences in the region and internationally.